Throughout the history of the film industry, few sequels have been worthy of bearing their source’s name, and even fewer have matched their predecessor in quality. In 1986, Aliens delivered an exhilarating and extremely entertaining experience which was markedly different from the horror offered by Alien but just as effective in its own right. In the same way that Ridley Scott made Alien the face of the science-fiction horror genre, so too did James Cameron establish Aliens as the face of the sci-fi action genre. Rather than recycling the structure and narrative style of the original film, the director of Aliens opted to take another approach that retained the essence of the series’ appeal, humans surviving an extraterrestial threat, while significantly enlarging the story’s scope, altering its tone, and exploring new themes. Aliens picks up on Ripley’s 57th year in hypersleep, during which her escape vessel finally makes its way back to the Weyland-Yutani Corporation. Ripley’s efforts to convince her employers of her ordeal fall mostly on deaf ears, but her story intrigues a man named Burke (played by Paul Reiser), who masks his true motives with an unconvincing display of benevolence. When the company loses contact with a terraforming colony on LV-426, the same barren planet from the first film, Burke organizes a team of U.S. Colonial Marines to investigate the scene and persuades Ripley to accompany them as an advisor, with the promise that they’re “going to destroy them, not to study”. Upon arriving at the colony, the marines find it deserted save for a frightened, young girl who was recently orphaned by xenomorphs and has been hiding in the center’s ducts ever since. The girl, Newt, soon draws close to Ripley, who tries in vain to reassure the child and herself of their safety. “These men are soldiers,” she says, but Newt grimly observes that “it won’t make any difference.” The rest of the movie basically serves to fulfill the young girl’s prediction, showing us the marines shift from offense to defense to panic and flight as their advanced technology is quickly nullified by the hive’s overwhelming strength of numbers and intelligence; the most fortunate victims are incinerated, crushed, or impaled by xeno jaws, while the least are dragged off to be cocooned and forcefully impregnated in the alien nest, presided over by the vicious and towering queen. Aliens is arguably a more intense movie than the first installment, not because it has more violence but because the stakes are higher for its central characters than they were beforehand. In Alien, Ripley had only to save her own skin, but the conflict in Aliens forces her to become a protector as well as a survivor, to sacrifice her own safety at times to rescue a girl whom she loves as a mother does her child. Newt represents the daughter that Ripley bore but lost in her decades of absence; her presence exposes aspects of Ripley’s character that the first film never had the opportunity to explore, and through her we learn that Ripley’s strength and determination are equaled by her compassion and unfaltering loyalty. Yet the movie is not merely a character analysis of Ripley, for it also oversees the development of the alien itself from a frightful image into a fully articulated antagonist. While its role as a mostly symbolic figure sufficed for the purposes of Alien’s story, the xenomorph had to become a complete character for an interesting sequel. Aliens brings the creature out of the shadows and into its own territory, where it shows its true colors as an intelligent and relentless pack hunter. 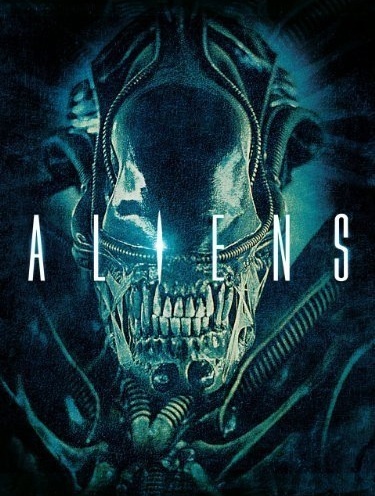 Whereas the alien from the first film was forced by circumstance to be a lone wolf, in Aliens we see its real nature as a mere element in an intricate, multi-leveled hive of parasitical lifeforms, which cooperate ruthlessly to protect their social order and harvest all outsiders as hosts to prolong their existence. The xenomorph hierarchy in Aliens is so well defined, so magnificently depicted, and so representative of nature’s raw brutality as to make it one of if not the most plausible and terrifying species in all of fiction. Even so, all of Aliens’ finesse in narrative would be wasted if not for the film’s glorious execution. Aliens is altogether one of the best-looking movies I’ve ever seen, whether evaluated in terms of special effects, art direction, costume design, sound, or cinematography. Scenes which look fantastical on paper are made credible by the excellent use of natural effects and real sets; unlike the action of modern pictures that use exorbitant amounts of CGI to tell stories, most of what the viewer witnesses in Aliens is real, captured in the camera frame and not on a computer program, and thus the movie is far more believable to the eyes than recent sci-fi pictures such as John Carter (actually a decent movie) or Cowboys and Aliens (a really, really bad movie that didn’t warrant a full review for this AVP series). From the first appearance of the aliens to the final showdown against their wrathful queen, the movie never ceases to amaze the viewer. The pacing of Aliens is also impeccable. Cameron devotes about an hour to quietly building up tension, establishing setting, and introducing characters, then lets action and explosive gunplay dominate most of the second half, pausing only to make room for now iconic one-liners (“They mostly come at night. Mostly.” “Get away from her, you b___!”) and give the characters time to breathe. This emphasis on action over exposition is one that’s been lost in many self-professed “action films”, including a long lineup of superhero flicks (Fantastic Four, The Incredible Hulk, Iron Man 2) and Predator, as I stated earlier. Aliens is more akin to the Transformers movies than to Predator, and as such it makes for marvelous entertainment. It’s just unfortunate that Aliens’ brilliant storytelling gets so bogged down with the abrasive political views its director so liberally (ha ha) stamped all over it. As with quite literally all his movies, James Cameron utilized Aliens as a vehicle to sow leftism in the minds of audiences by conspicuously attacking corporations, the U.S. military, and men in general while hammering the audience with cheesy girl-power feminism. The first hour of the movie is basically an indulgent caricature of soldiers as vulgar, dull-witted, brutish, trigger-happy thugs characterized by a complete lack of honor and chivalry. Moreover, they’re portrayed as a bunch of whiny, spineless cowards who disintegrate in battle and quaver in the face of death, with the only exceptions being women, i.e. Ripley and Vasquez, or a robot. Hey, James Cameron, anyone ever mistake you for a man? You may wonder how I can possibly praise Aliens in light of its flamingly un-American views; had the movie been conceived as political commentary first and science-fiction thriller second, then I would not regard it as highly, but Aliens is an exceedingly strong action film and merits commendation for excelling in its genre. One could also argue that the movie is a scathing invective of environmental extremists, who esteem animals higher than their fellow men and willfully subjugate human life to the preservation of nature. “This is clearly an important species we’re dealing with and I don’t think that you or I or anybody has the right to arbitrarily exterminate them,” says the romantically minded conservationist Burke. As happens so often in the real world, the environmentalist’s efforts to save nature result in his own destruction at the jaws of the very beasts he revered. Aliens is essentially the counterpart to James Cameron’s later feature, Avatar, a movie that celebrated earth worship rather than ridiculing it. The former movie gives a strictly realistic view of the untamed, natural world, while the latter endorses idealistic fantasies about a peaceful earth wherein animals may coexist without violence or strife. In the end, Aliens is not just a perfect sequel but a near perfect movie in its own right. A work that was faithful to its roots but innovative in its own storytelling, Aliens rightly continues to inspire countless filmmakers and franchises, most prominently Halo, and to this day it sets the standard by which all sci-fi action pictures should be judged. Let movies like this never perish from cinema, or it’ll be game over, man, game over.